With more than a million copies sold, The Seven Principles for Making Marriage Work continues to strengthen relationships worldwide. Although originally written for married couples, the Seven Principles have shown to be universal, whether in romantic relationships or in relationships with family, co-workers, or friends. Straightforward yet profound, these principles teach proven approaches for managing conflict, creating common ground, and achieving greater levels of connection. Based on Dr. Gottman’s New York Times bestseller, The Seven Principles for Making Marriage Work, this new workshop helps singles learn how to have fulfilling and successful relationships. What qualities should I look for in a partner? What questions should I ask on a first date? You will learn how to cultivate friendship, fondness, and admiration as the basis of all happy relationships. You will learn the phases of a relationship, as well as how to know who you can trust. You will learn how to understand the role of constructive conflict in healthy relationships. You will learn how to focus on life dreams and shared meaning as a route to fulfilling relationships and a fulfilling life for yourself. This workshop is for single people of any age who want to have a meaningful relationship, including people who are trying to heal from negative past relationships. Attendees may want to understand what a healthy relationship looks like, or they may be ready for commitment after a long time of being single. Previous workshops have included attendees who are widowers, divorced, those who have never been married, and those who are entering a new relationship. 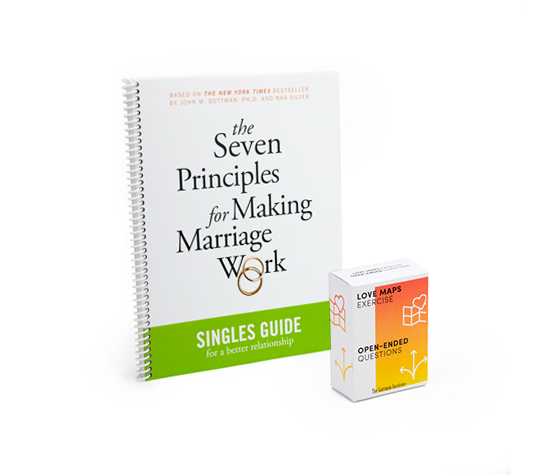 In addition to a greater understanding of how to build friendship, manage conflict, and create shared meaning in your future relationship, you will receive the brand new Seven Principles Singles Guide and a set of our popular Love Map and Open-Ended Questions card decks (pictured on the right). Here’s what real singles have said about the workshop. This is a singles event, so is it a way to meet up with new dates? This is not in any way a singles mixer; it is meant to help you learn skills and focus on what you want in a healthy relationship. If I am in a relationship, can I still attend? If you are in the early stages of a relationship, this might be a helpful workshop for you, however, we will discuss dating during the workshop. If your partner cannot attend, then it can absolutely benefit you, but the intended audience is singles looking to learn relationship skills. Is this a lecture-style workshop? It is part lecture, but it is also interactive and designed to be a fun and engaging experience! There will be role-plays by the presenters, video clips, and both large and small group exercises. The audience can give their input share their experiences if they choose to. Is this a group therapy experience? This workshop is educational in nature, and it is not therapy. There will be group discussions, but participation is optional and we encourage you only to share what you are comfortable with sharing.